As she turned her face towards me I could see the girl was clearly crying. The reflection of the burning effigy flickering on her made up features. She was crying because the Fallas(Valencia’s principal fiestas to celebrate San Jose and the arrival of spring) had finished and they were burning her local Falla( two storey high effigy). This emotional committment is common in Spanish fiestas. In fact, passion is what fiestas are all about. Take any fiesta you can think of in Spain and analyse it and you will see what motivates or drives the whole thing is one thing. Whether it be Semana Santa in Andalucia, San Fermines in Pamplona or Fallas in Valencia they all have the same common denominator: passion. 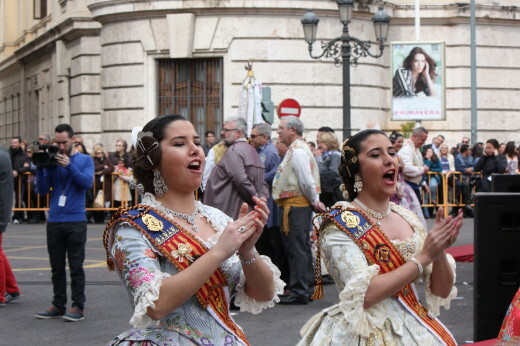 People in Spain adore their fiestas(most people as obviously there are those that don’t) and look forward to and plan for the occasion all year. You’ll find besides passion there is also pride. 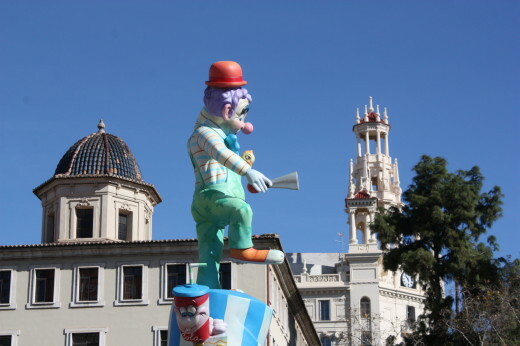 To win 1st prize for your Falla in Valencia is the culmination of a year’s work and is similar to winning the lottery or World Cup. I also adore fiestas. Why? Simply because they are a moment to enjoy a few days with friends,family and neighbours and to forget about the problems of everyday life. Each fiesta is an expression of its village,town or city. 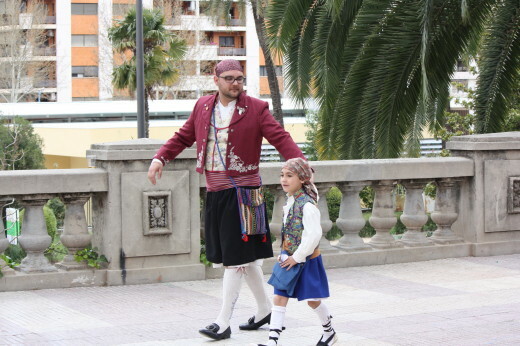 A way of celebrating traditions that are unique to that area. A fiesta is almost a window into the culture and history of that place,giving you an opportunity to get to know it a little in a relatively short period of time. Many fiestas involve excess and the extreme. 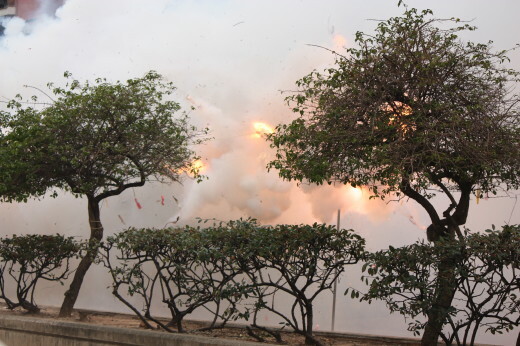 In Valencia the addiction to gunpowder and noise is serial pyromania athough nowadays with EC laws there are less fireworks on the streets. However, if you visit the Fallas you can’t help noticing that gunpowder,regional dress,the effigies,the Virgin Mary and the family(San Jose is father’s day) are all celebrated with passion.What impresses me most of all, year after year is that young people actively take part and continue the traditions which are passed on from mother to daughter and from father to son. Strangely, passion or passionate is a word that is often misused or rather overused in the Anglo-Saxon world. Over the last ten years it has crept into the professional world and you can often read now how for example a marketing manager is ” passionate about advertising,wine,cycling and my children”. It’s something that has to be declared. Here in Spain people don’t declare their passion. They simply are passionate. And following on from that fiestas are fullblooded passion. 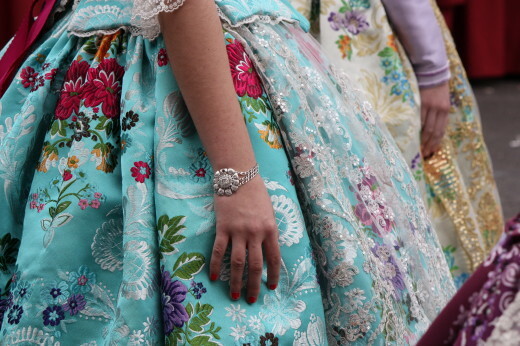 In any fiesta you can see it in people’s eyes, in the way they dance, sing and laugh. The musical bands,often bleary eyed and hungover,don`t always play note perfect music but you can see and hear that they love playing music. 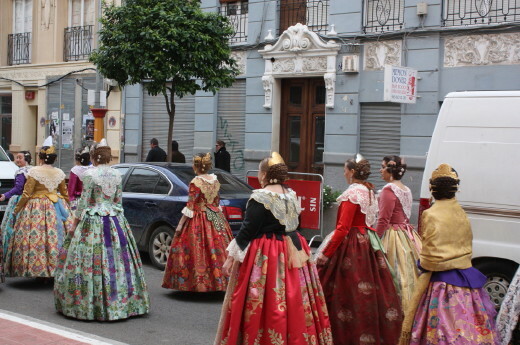 The Spanish,like any nationality have their faults, but they do fiestas and passion better than anyone. It doesn’t matter which fiesta you go to, you can’t fail to see people’s committment and passion. It never fails to impress me that people will sacrifice serious time, money and emotion for their fiesta. Next time you go to a fiesta stop for a minute and observe how people “live” the fiesta. See if you can see the look in their eyes, their laughter and their committment. It’s one of the really special things about Spain. 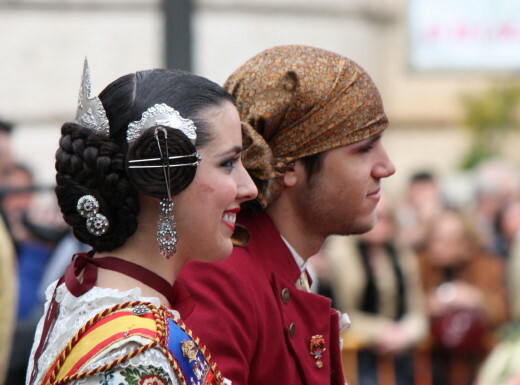 This entry was posted in cultural traditions, Spain and tagged Culture, Customs, fallas, Fiestas, holidays Spain, Regional costumes, spanish culture, Spanish Traditions, Travel, Valencia by Paddy Waller. Bookmark the permalink. Nothing better than a Spanish festival! I like to say there is crazy, and then there is San Fermin Crazy haha. One of the best experiences of my life was dancing in the streets of Pamplona. Yep Cole, Pamplona is without doubt one of the best and wildest fiestas in Spain. There are so many good ones it’s difficult to judge which is the best but Pamplona is a big contender. Haha “serial pyromania” made me laugh! I love the passion alive at Spanish festivals too, and how it’s been carried on throughout so many generations. The traditional outfits are so beautiful. People really commit to the spirit of the fiesta 100%, and it’s so much fun to see.